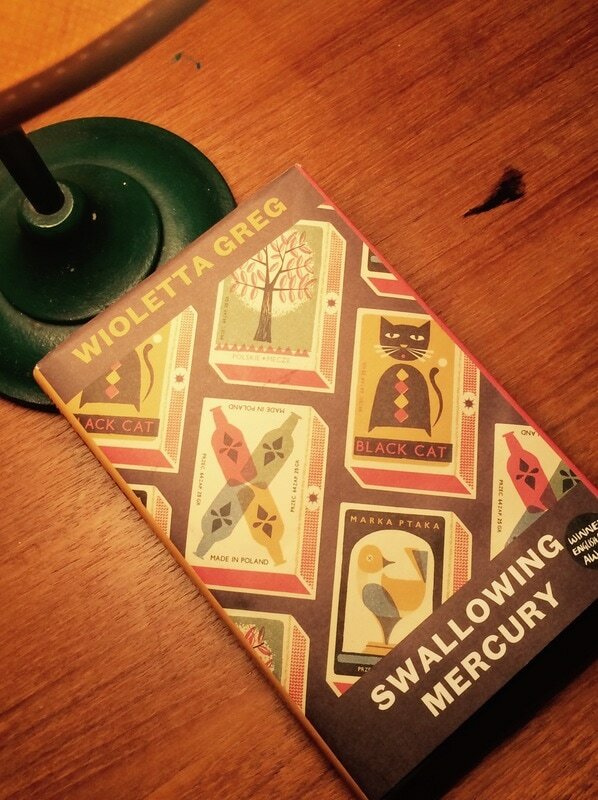 Swallowing Mercury by Wioletta Greg, translated by Eliza Marciniak, Portobello Books, 2017. ....It is not easy to be a poet; certainly not when you live away from the language in which you feel, see, and analyze everything around you. Emigration isn’t easy for poets, who live to seize the world in short verses. It is quite different with fiction; prose has its own rules, rights for reminiscences and description. 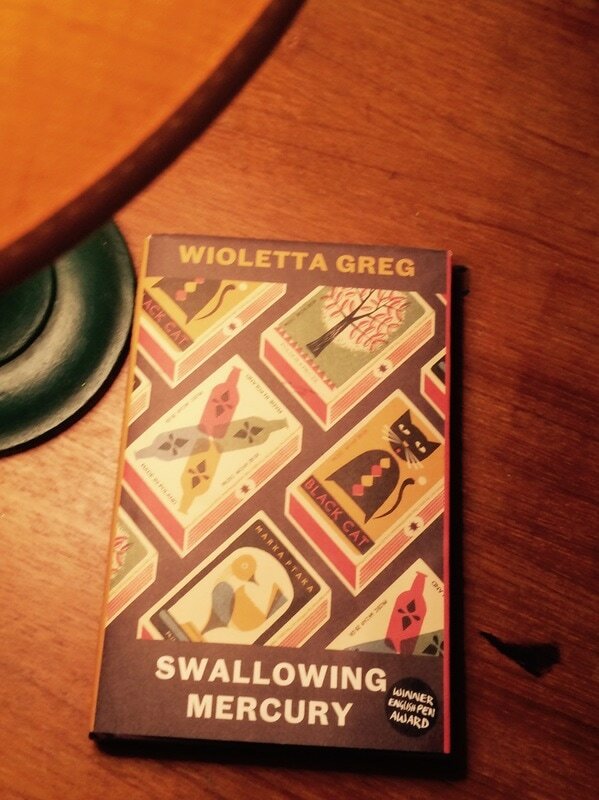 Perhaps this is why Wioletta Greg decided to write prose even though for years she has been writing intriguing poetry, both serious and ironic, and deeply penetrating the laws of reality? stolen yesterday from the local scrap yard. the fetor of wild ponds and lime pits. in kisses, bitter marjoram pollen. Is there a point to ask about the titles? The editor of the book, Ka Bradley, from the Portobello said during our meeting at UCL SSEES 2017 that changing the title was an editorial decision. 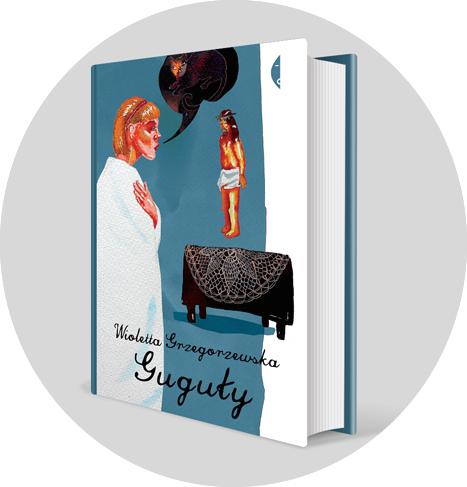 I think it is an excellent choice, and outstanding editing (even though in the English version one little chapter from the Polish original text has been scrapped out (Collected works/ Dzieła wszystkie), I think that the editor made the right decision in terms of consistency of the text). I am sure that we will get this missing part in the next novels to come, we will still learn about it. The cover of the book? “Collecting a matchbox labels turned out to be a difficult hobby” (p. 95). Ostatnio dowiedziałam się, że na mojej ulicy całe lato 1874 roku spędził Karol Marks. Po drodze do piekarni postanawiam przyjrzeć się budynkowi, gdzie przebywał człowiek, który zmienił świat. Może trafię na jakieś ślady, znajdę tabliczkę czy porysowaną cegłę. Mijam studio artystyczne Depozitory - budynek, który podczas drugiej wojny światowej był magazynem zboża, a wcześniej, w czasach Marksa, kaplicą metodystów, mijam Brontë House i w końcu zatrzymuję się przy jedenastce. Czekam kilkanaście minut, wzbudzając zainteresowanie drogowców, którzy ukryci za żółtymi bramkami, trzeci tydzień penetrują studzienki kanalizacyjne. Wreszcie moja cierpliwość zostaje nagrodzona. Coś szarego miga w oknie. Jest! To on! Trochę się zmienił przez te wszystkie lata. Broda mu się przerzedziła, wzrok złagodniał, a po minie poznaję, że nie dokuczają mu już czyraki pod pachami. Wygląda przez okno i z dziwnym spokojem obserwuje Nelson Street, która dawno straciła swój burżuazyjny charakter. Regencyjne wille należące w dziewiętnastym wieku do klasy wyższej, wynajmują teraz robotnicy. Ich uniformy powiewają na sznurach. W suterenie, w której mieszka bezrobotne małżeństwo z trojgiem dzieci, zapala się lampka. Zaniedbane przez landlordów domy przeżera wilgoć. W ogrodach przybywa gratów. Farba kruszy się z futryn. Jest ósma rano. Roznosi się zapach przypalonego mleka i tostów. Cała ulica, w której centrum znajduje się przedszkole, zanosi się płaczem. Niewyspane matki pchają wózki. Emigrant, uczestnik Arabskiej Wiosny Ludów, biegnie na pierwszą zmianę, aby powalczyć na zmywaku. A Marks, dziś pręgowany dachowiec, nie reaguje, jakby zobojętniał na świat, przeciąga się i ziewa. Ożywia się dopiero wtedy, gdy listopadowy podmuch strącą liście z pożółkłego klonu i nabija je na druty wystające z ogrodzenia. Recently, I have discovered that in the summer of 1874, Karl Marx resided half way up my road. As I walked to the bakery, I took a closer look at the building once occupied by a man who changed the world. Maybe I will find some clues, a message or a scratched brick. I pass the Depozitory (currently an exhibition centre, a granary during WW2 and a Methodist chapel when Marx was alive), then Brontë House, finally coming to a stop at number 11. Fifteen minutes pass, I am noticed by road workers who for over two weeks have been penetrating the sewers. Eventually my patience pays off, something gray flashes by the window. There, it’s him! He has changed over all those years, a thinner beard, softer features. The expression tells me that arm-pit boils bother him no longer. Peeking out of the window, he observes Nelson Street, which has lost its bourgeois character. High-class villas now belong to working commuters, their uniforms rustle in the wind. A light shines in one of the basements, an unemployed couple occupies it; they have three children. Houses consumed by mold, neglected by their landlords, gardens filled with lumber. Paint crumbles of walls. It's eight in the morning, air filled with the smell of burned toast and crying sounds from the kindergarten. Mothers struggle with pushchairs, an emigrant – participant in the Arab Spring, sprints for the first shift, to fight some more with the dishes. And Marx? Doesn't react, indifferent to the world, he stretches and yawns. Then moves his tail uneasily, as the November wind knocks leaves off a yellow maple tree, straight onto sharp fence wires.